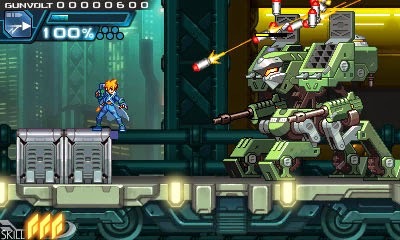 A game by Inti Creates for 3DS and PC, originally released in 2014. 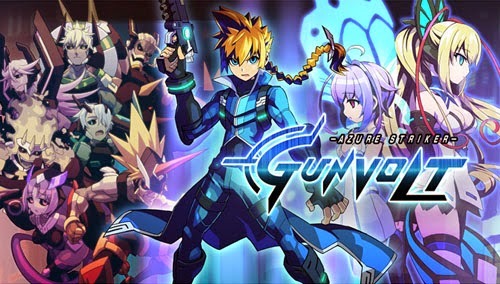 Azure Striker Gunvolt stars the titular Gunvolt who is on a mission to silence “The Muse” for an organization called Quill. 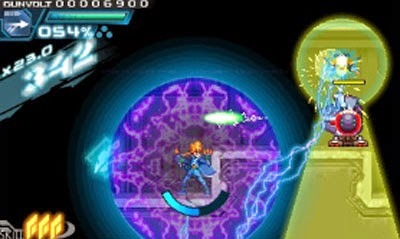 The game begins with Gunvolt tied to a chair and being tortured by a guy with some sort of electrical whip… which wasn’t a grand idea, given Gunvolt’s electricity manipulation powers. 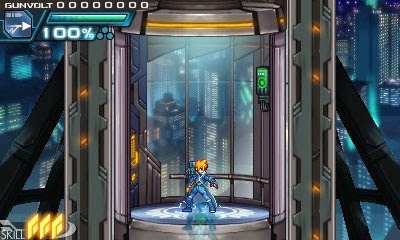 Gunvolt was just waiting for the guy to soliloquize for a bit and give away the true location of The Muse, at which point he makes his escape and fights his way to her in the game’s first mission. But when he meets her, Gunvolt realizes The Muse is just a young girl, named Joule, who is being used by an evil organization called the Sumeragi Group. Despite this, Quill orders that Gunvolt kill her, but he decides to rescue her instead, and leaves the Quill organization to set out on his own, taking freelance work while offering protection to Joule. 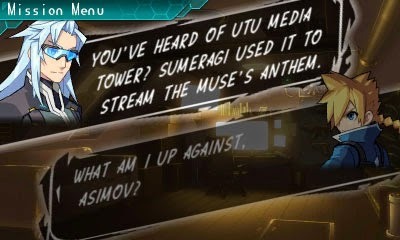 Of course, intrigue abounds, and Gunvolt’s string of odd jobs eventually leads him back to the Sumeragi again. 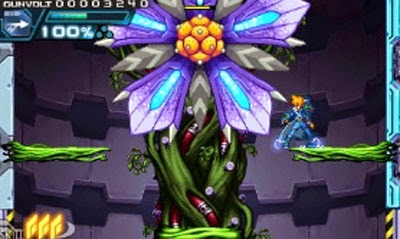 Azure Striker Gunvolt’s developer, Inti Creates, is also the developer behind the bulk of the latter-day Mega Man games, including the Mega Man Zero series, Mega Man 9, Mega Man 10, Mega Man ZX, and Mega Man ZX Advent. There are a number of design similarities between this game and the ZX series in particular, including a blue-clad hero, the aesthetics of the game world, basic environmental navigation, and the use of the touch screen to activate special abilities. 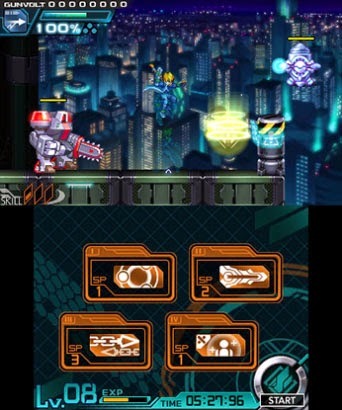 Despite these similarities, however, the gameplay in Azure Striker Gunvolt is quite different from the Mega Man series… and from shooters in general. The biggest difference is the way in which Gunvolt’s weapon operates. 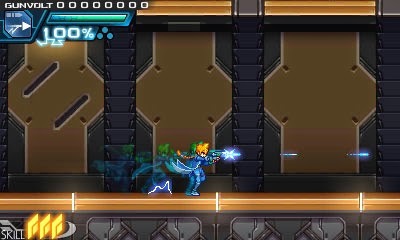 At the start of his adventure, Gunvolt has a rapid fire weapon that can send off a series of bolts, but these do very little damage to enemies. 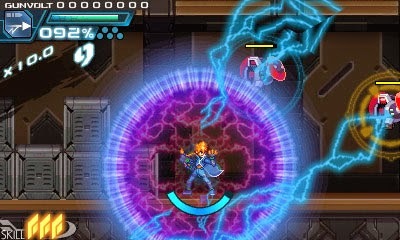 Instead, hitting an enemy with a bolt “tags” it, and allows Gunvolt to damage it with his primary ability, which is an electrical charge. 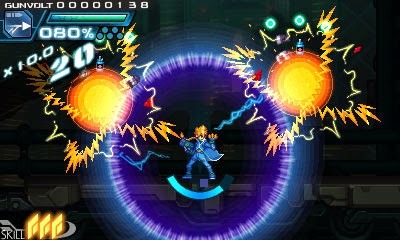 Gunvolt is able to create a ring of electricity around his body, and use of this ability is governed by an EP meter that refills slowly when not in use. Alternately, the player may double-tap DOWN to manually refill the meter when he’s not attacking. The ring of electricity serves a number of purposes. 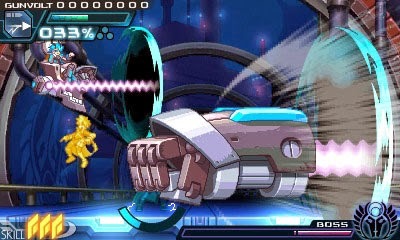 For one, it causes minor damage to enemies within its radius, allowing Gunvolt to deal slow damage to shielded enemies or take out swarms of small weak enemies. 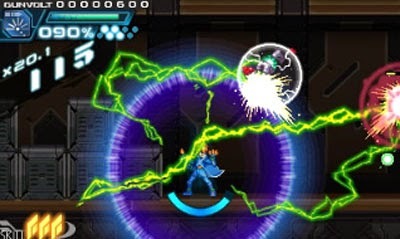 Secondly, the ring protects Gunvolt from most incoming projectiles, absorbing missiles and bullets, although it doesn’t work against energy blasts. 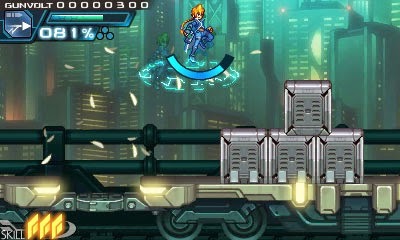 Thirdly, engaging the shield in the air allows Gunvolt to slow his descent, letting him reach greater distances with his jumps and line up platform landings. Finally, and most importantly, this is Gunvolt’s primary means of attack. By holding down the button, bolts of electricity extend outward from the circle and make contact with all tagged enemies. 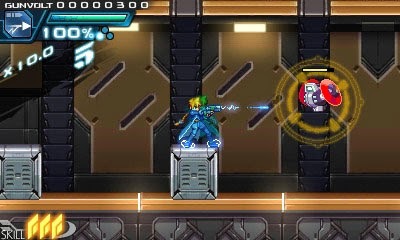 By default, Gunvolt may tag up to three enemies, and tags are stackable, allowing the player to tag a single enemy multiple times. 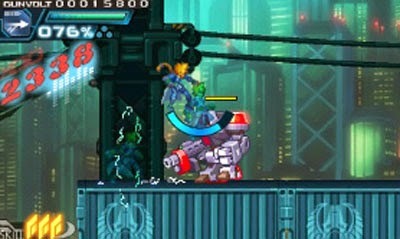 Triple-tagging an enemy allows the player to unleash added damage to the selected enemy, making it particularly useful against armored foes and bosses. 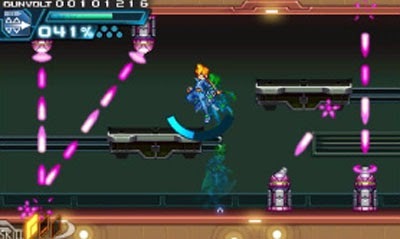 The first level presents a number of enemies that illustrate different ways to attack, including weak air-based foes, energy-blasting enemies that can penetrate your electrical barrier, armored enemies that should be triple-tagged, and shielded enemies that require the proper timing to strike. There’s also a tank-like boss that requires you to unleash an electrical charge on its head to disable it, and then tag and zap its weak point to bring it down… only to have it recover if you don’t act quickly enough. The ring of electricity also has a number of secondary environmental effects, depending on the level theme. 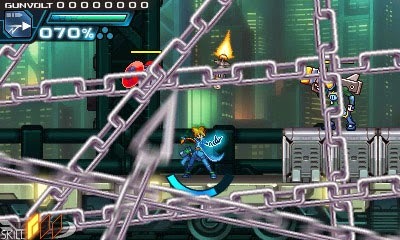 For instance, one level contains metal platforms that are attracted toward Gunvolt when the charge is active, allowing him to move platforms toward him, pull them away to open up new paths, or manipulate them to put them between himself and laser-firing turrets. 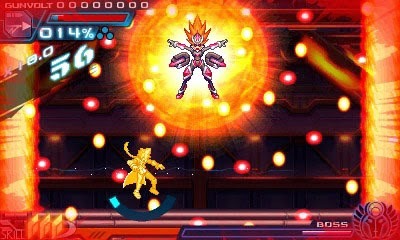 In addition to these indirect attacks and environmental manipulation abilities, Gunvolt has a 2x variable jump and a dash move, as well as the ability to wall jump. Once the player completes the first level, he learns that his default abilities can be altered through an extensive upgrade system, which is driven by materials collected during the mission. Completing each mission rewards the player with a certain number of materials, with additional materials being gained based on the player’s level ranking and by picking up medals tucked around the environment. 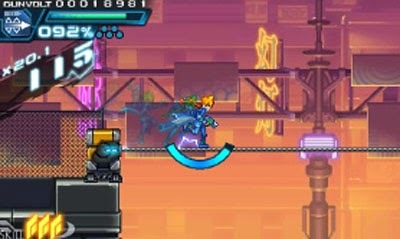 With the right materials on hand – and enough currency to make the transaction – the player may upgrade a number of Gunvolt’s equipped items, offering dozens of secondary abilities and passive buffs. 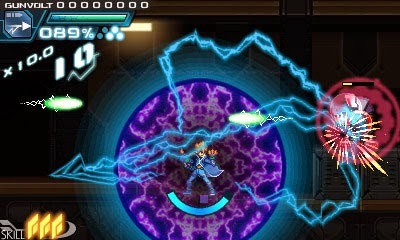 Gunvolt has five available item slots that allow him to swap out his bolt weapon, equip items to his right and left eyes independently, and wear a ring and a pendant. A wide range of abilities and upgrades are available, most of which have some sort of tradeoff, such as increasing the power of your electrical attacks, but draining the electricity meter more quickly. One of the pendants turns off your ability to block incoming projectiles with your electrical attack, but it allows you to sustain more damage, which makes it useful against energy-based enemies and bosses. Some equippable items even allow for entirely new skills, such as a double jump (and triple jump!) and an air dash, which can be particularly useful for environmental navigation, and makes it easier for the player to avoid attacks. However, these abilities also draw from the same meter as your electrical attack which means that they cannot be used when the meter is overloaded, and they drain the meter more quickly if you use them while attacking. As players craft items, new and more powerful items become available. Many of these higher tier upgrades require better materials or the sacrifice of multiple lower-powered items. Players may earn better materials and more money by taking on challenges – which may be selected up to three at a time – adding secondary objectives to previously completed levels, including completing the level under a certain time limit or with a certain rank. Completing lower level challenges allows the player to unlock more difficult ones. 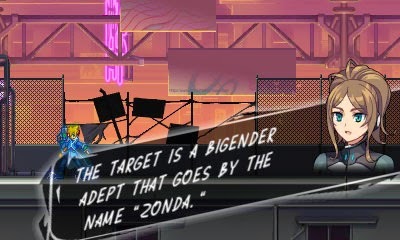 While the range of available items is quite large, the game’s design doesn’t support the need for vast customization of your character to complete the game. For the most part, these crafted items allow players to make adjustments to suit their play style, but they are not required in order to overcome any specific obstacles. In fact, most of these items are only useful for completing the optional challenges when repaying levels, which – in turn – provides better materials to craft more items to complete more challenges. As such, players wishing to simply complete the game are free to make their way straight through from beginning to end with very few modifications to their character. Players wishing to replay levels and complete optional challenges will want to make use of the upgrade system to customize their character to complete specific tasks. Players who replay previous areas and thoroughly explore the environment may also be rewarded with a new final boss fight and the game's true ending. Skilled players can earn better materials by increasing their rank, which is done by completing missions quickly and building up a large combo. By stringing together attacks without taking damage, a “kudos” system counts quickly upward, offering the player an ever increasing score multiplier. The combo is also reset if the player uses any offensive special abilities or touches any checkpoints, which means that players may opt to avoid activating checkpoints to keep their kudos count high. Players may also earn kudos bonuses by performing certain maneuvers, such as triple-tagging an enemy, destroying multiple enemies simultaneously, or destroying an enemy while in the air. Some of the optional challenges center specifically on achieving a certain kudos threshold during the level, and the background music changes when you reach 1,000 kudos. There are a number of different bolt types that are earned slowly as the player completes missions, and these alter the way in which the player tags enemies. The starting Cerberus weapon allows for rapid fire bolts and tagging of up to three enemies. Other bolt types allow players to tag more enemies, fire bolts that penetrate enemies, fire energy bolts that hug the floor and ceiling, and even drop a bot behind them that spins around and fires stream of bolts. Here again, players may opt to hold onto their starting weapon throughout the game or select a new weapon based on their play style or the criteria of a specific challenge. Players are free to swap out bolt weapons and other equipped items during the course of the mission, but they also have access to a series of skills that can only be changed between missions. By playing through missions and levelling up, players slowly unlock an array of skills that may be accessed by tapping their associated icons on the touch screen. These include offensive abilities, such as summoning a large sword to cause localized damage, or calling upon a series of chains to hit multiple enemies simultaneously. There are also a number of support abilities including a quick health recharge and a quick recharge for your electrical ability if you have used it to the point that it overloaded. Up to four skills may be equipped a time, and these draw from a separate meter that refills very slowly. More powerful abilities drain the meter more quickly, and each skill has a cooldown period, preventing the player from spamming them. Additionally, use of skills makes the player invincible for a short time, potentially allowing the player to dodge a powerful attack while unleashing a retaliatory strike or healing up a bit. Players may also find healing items within the levels in the form of small or large pill bottles. Checkpoints appear fairly frequently, so players won’t lose much progress if they happen to fall in battle, and they have infinite lives. In addition, by speaking with Joule between missions, you will “feel a little closer” to her. If you maintain this relationship with Joule, she may resurrect you if you fall multiple times in battle, and this also makes you invincible against regular enemy attacks, essentially letting you run through the area without taking damage so that you can continue moving forward. However, you are not invincible against boss attacks, so you’ll still have to hold your own when you reach the end of the level. Players are required to complete a starting level, at which point six new levels open up, which may be played in any order. Halfway through these levels, the narrative forces you into a new level, after which you may return to complete the remaining levels, and open up four more. 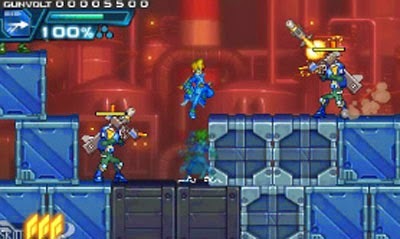 Each level has a specific theme and unique challenges, although most are populated with the same set of basic enemies. One level has the player rushing through a submersible warship, and after a while, the ship starts filling up with water. 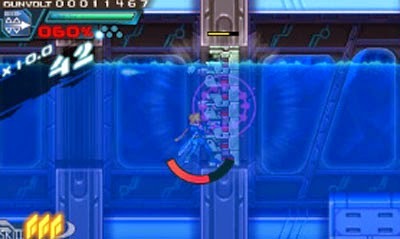 While underwater, Gunvolt cannot use his electrical attacks, and he will start losing health if he stays under too long. This leads to a lot of quick deaths as falling behind the rising water level also removes your ability to destroy enemies ahead of you, and the rising water is persistent between areas, so falling too far behind means that there is no way to recover. 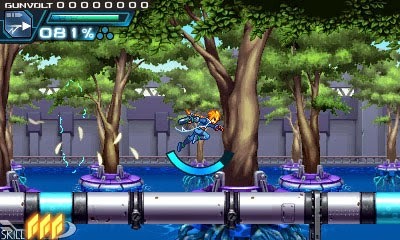 One level features boost pads that send Gunvolt flying into the air, and these are interspersed with bottomless pits, requiring players to move carefully – and use their double jump if they have one – to avoid instant death. A fire-based level has you blasting through destructible blocks with your electricity and setting off chain reactions that kill enemies. Yet another level has you manipulating color-coded switches to disable lights of the same color, but turning out the lights reveals creatures that roam in the dark, and destroying them causes their blood to spray into the foreground, blocking your view. Each level ends in a boss fight that has the player watching for telegraphs, avoiding major attacks, and slowly whittling down the boss’ health. Since the player doesn’t attack directly, boss battles generally consist of waiting for the opportunity to tag the boss multiple times and then dodging attacks while you unleash electrical damage from a distance. 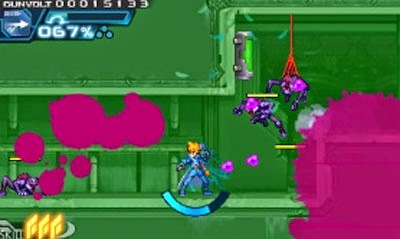 Players must pay close attention to the boss’ timing to take a moment to stop attacking and double-tap DOWN to recharge their electrical meter. Each boss’ health meter is divided into three sections, and depleting the first two will cause the boss to start using his or her special attacks against you, making the battle even tougher. Learning the patterns and watching for openings to attack will see you through most battles, although bringing in a healing skill can help you reach victory through brute force. But you can’t stumble your way through entirely, as you’ll be facing these baddies again in the game’s requisite boss rush. Azure Striker Gunvolt has an ongoing narrative – which continues into Mighty Gunvolt – complete with extended cutscenes and back-and-forth dialogue between Gunvolt and his colleagues and foes, but this never comes together in any sort of meaningful way beyond key plot points. Fortunately, dialogue and cutscenes may be skipped. There are also occasional verbal exclamations from various characters during the game, although these remain in Japanese. 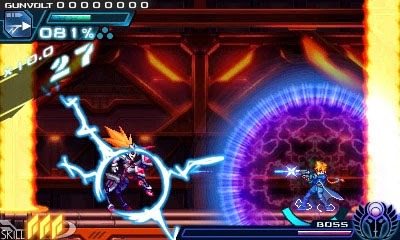 Azure Striker Gunvolt was developed by Japanese studio Inti Creates. The company is the developer behind a number of latter day entries in the Mega Man series, including the Mega Man Zero series, Mega Man 9, Mega Man 10, Mega Man ZX, and Mega Man ZX Advent. The studio has also collaborated with other developers, including working with Alchemist on Gal*Gun, working with Keiji Inafune’s company Comcept on Mighty No. 9, and working with WayForward on Shantae: Half-Genie Hero and Shantae and the Pirate's Curse. 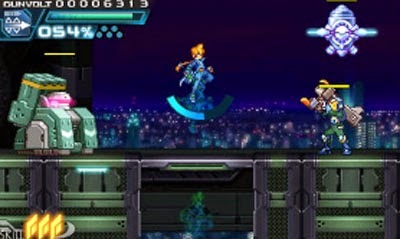 At the same time that the company released Azure Striker Gunvolt, they also released a short 8-bit style crossover game called Mighty Gunvolt, starring characters from Azure Striker Gunvolt, Gal*Gun, and Mighty No. 9.